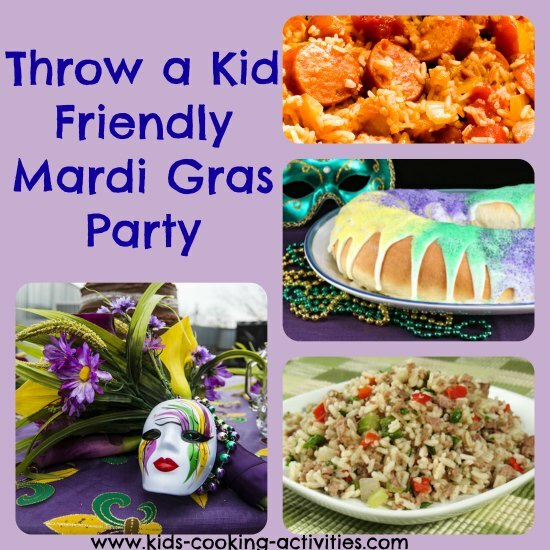 If you want to throw a real party in your home for your kids, it's the time of year for a Mardi Gras party! The date of Mardi Gras changes each calendar year but it is celebrated the beginning of February. Mardi Gras is the festival to hail the beginning of Lent fasting. Although the parades and parties at this time of year aren't kid friendly. You can wear the fancy bead necklaces, put on your own parade at home, and make it a party complete with the foods served at Mardi Gras in Louisiana. 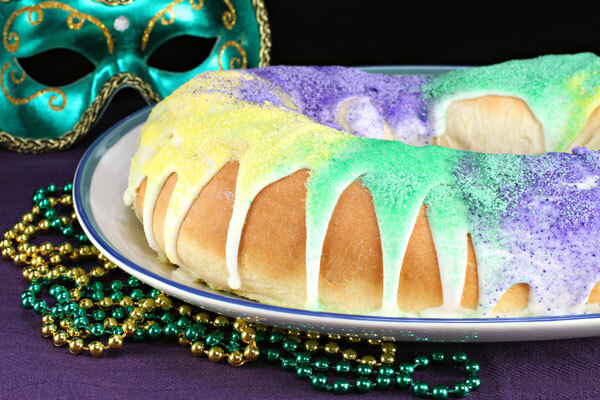 King Cake is served on Mardi Gras in Louisiana, and it looks like a giant cinnamon roll decorated with purple, gold, and green icing. These three Mardi Gras colors represent purple- justice, green- faith, gold- power. Traditionally a small trinket, like a plastic baby doll representing the baby Jesus, is hidden inside the cake. Whoever finds the trinket in their slice of cake is hailed the King or Queen of the day. Note if you do this that it can cause a choking hazard. If you want to add the baby add this to the bottom of your cake after it cooks. Mix 1/3 cup of sugar, 16 ounces of sour cream, ¼ cup of butter, and a pinch of salt in a saucepan until the butter melts. Mix ½ ounce of dry yeast with half a cup of warm water and a tablespoon of sugar, and let it sit for 5 minutes to activate the yeast. Add both the sour cream and yeast mixtures to a bowl with 6 ½ cups of flour and 2 eggs, and beat well. Knead the dough for 10 minutes, let it rise for an hour, and roll it out into a large oval ring. Bake the dough for about 15 minutes at 375 F.
If adding the trinket or baby, turn the cake upside down and press into cake. Turn right side up again and place on serving plate. Drizzle icing over it once it's cool. Shake purple, green and yellow colored sugar over the top of the frosting. Or as an alternative use purple, green and yellow frosting. Dirty rice is traditionally served at Mardi Gras, and it's a deliciously unique Cajun dish that's easy to make. 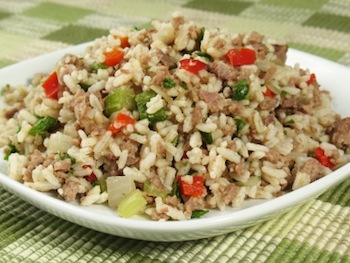 Dirty rice gets its flavor from chicken livers! Cook 1 ½ cups of long grain rice, using chicken broth instead of 1/3 of the water. Drizzle olive oil over the rice. Puree ½ cup of chicken liver in a blender. Cook ½ pound of ground pork, 3 bacon slices, half an onion, 2 stalks of celery, 2 green onions, half a red bell pepper, 1 tablespoon of Cajun seasoning, and the blended chicken livers in a large pot. Add in the rice and half a cup of chicken broth, mix well, and serve hot. Shrimp Po Boys are the classic Mardi Gras sandwich, which makes this a ideal for your Mardi Gras theme party. Combine an egg with one cup of milk. De-vein 1 ½ pounds of shrimp, and soak them in the milk and egg mix. Mix together half a cup of flour with 1 cup of breadcrumbs and seafood seasoning, and use that to bread the shrimp. Fry the shrimp in an inch of hot oil, and cook until golden. Slice a roll in half, and pile the shrimp, tomato slices, lettuce, pickle relish, spicy mustard, hot sauce, and lemon juice on top. See more Cajun and Southern USA cooking recipes here.